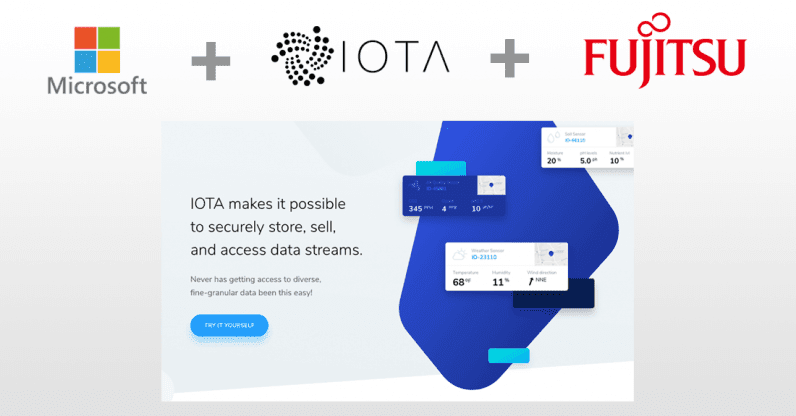 Up-and-coming cryptocurrency startup IOTA has partnered with Microsoft, Fujitsu, and twenty more companies to launch the first publicly accessible data marketplace for the Internet of Things. What makes this undertaking especially intriguing is that the marketplace will be entirely powered by a distributed ledger. The initiative, which will allow stakeholders to share and monetize their data in a secure way, aims to demonstrate a proof of concept for a tamper-proof data marketplace. Once uploaded to IOTA’s decentralized ledger, all data is distributed to countless nodes in order to ensure immutability. IOTA is currently the ninth biggest cryptocurrency by market share on Coin Market Cap, boasting a market cap of $2.95 billion. What is notable is that IOTA uses an interesting new technique to distribute and decentralize its ledger. Unlike standard blockchain technology used by most companies, IOTA relies on a method it calls Tangle. Compared to blockchain, IOTA co-founders Dominik Schiener and David Sønstebø claim Tangle offers free transactions and much better scaling opportunities. Those curious to see how Tangle works in practice can check out this visual demo of how the network scales. In addition to Microsoft and Fujitsu, a number of other high-profile companies – including Deutsche Telekom, Bosch, Accenture, and PwC – will also participate in the demo. “We are excited to partner with the IOTA Foundation and proud to be associated with its new data marketplace initiative,” said Microsoft blockchain specialist Omkar Naik. “This next generation [sic] technology will accelerate the connected, intelligent world and go beyond blockchain that will foster innovation real world solutions, applications and pilots for our customers,” he continued. The marketplace demo will run until January. IOTA has promised to release a series of blog posts and case studies to showcase the various ways in which companies and individuals can benefit from using its technology. Ordinary netizens will also have a chance to sell their data on the marketplace by connecting their IoT devices to the IOTA ledger. This will enable them to cash in on various data like weather station statistics and more. Meanwhile, those curious to know more about IOTA, Tangle, and its new marketplace ought to tune in to our upcoming TNW Answers session with co-founders Schiener and Sønstebø this Thursday at 8:00 AM PDT, where they will be responding to questions from readers.